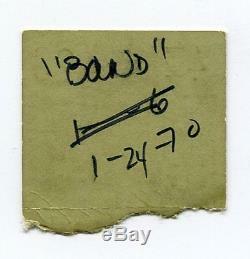 THE BAND concert ticket stub 1-24-1970 2nd show. Venue & Location: Pasadena Civic Auditorium, Pasadena, California. The Band consisted of the following musicians: Rick Danko, Levon Helm, Garth Hudson, Richard Manuel, Robbie Robertson. 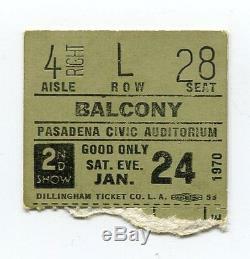 The item "THE BAND Concert Ticket Stub 1-24-1970 Pasadena Civic Auditorium 2nd Show RARE" is in sale since Tuesday, December 22, 2015. This item is in the category "Entertainment Memorabilia\Music Memorabilia\Rock & Pop\Artists B\Other Rock & Pop Artists B". The seller is "musicabilia4u" and is located in Denville, New Jersey. This item can be shipped to United States.